The Independent Corrupt Practices and Other Related Offences Commission (ICPC) has handed over 12 vehicles it recovered to the Transmission Company of Nigeria (TCN). The vehicles which included one Toyota Land Cruiser and 11 4×4 Hilux trucks were recovered from some retired directors of the Agency who had left with the vehicles upon their retirement. Speaking at the handing-over ceremony, Mr. Tunji Jabaru of Assets Tracing, Recovery and Management Unit (ATRM), who represented the Commission said that ICPC had received a petition in 2017 on the allegation that some directors had made away with TCN’s vehicles. “We investigated the matter and the result of that is the recovery of these vehicles and the handing over of same which is being done today”, he said. 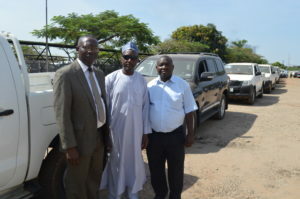 In his remarks at the ceremony, Mr. Mohammed Adamu Jere, Transport Officer, TCN, who represented the Managing Director of the Agency, Mr. Usman Mohammed, expressed appreciation to the Commission for the effort made to recover the vehicles, saying that the agency had ‘lost hope of getting the vehicles back before ICPC’s intervention’. He stressed the importance of the recovered vehicles to the agency, especially the Hilux trucks adding that, “recovering and releasing these vehicles to our Agency will help the government in improving power supply in the country”.